Omni-channel, which has been rising as a hot topic for several years, was a dominant theme at the big NRF show last week. It's a big topic with many dimensions. Here are some of the more interesting things from the show. 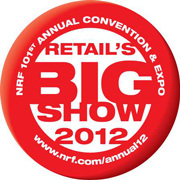 NRF’s annual BIG Show provides a great opportunity each year to survey the retail landscape and get a feel for the mood and trends across the industry. I would describe the mood this year as cautiously upbeat. Attendance was up, number of exhibitors was up, booths were bigger, and it seems retailers are ready to make some investments. Most are anticipating moderate growth. Many have deferred investments during the downturn, creating some pent-up demand for new solutions and upgrades. The dominant theme at NRF this year was still omni-channel. For many years, people have been talking about the rising importance of multi-channel and using the term omni-channel to describe the complete and seamless integration of the customer’s experience across multiple channels. Technology providers use a variety of terms—All Channel, Multichannel, Cross-Channel, Omni-Channel, Channel-Clustering or the Merged Channel. It seemed everyone has a name for their channel strategy this year, including JDA, Symphony EYC (the merger of Aldata and EYC), Epicor, NetSuite, SAP, and LogFire to name a few. Customers will come in through any channel and expect seamless service—from social connections through logistics—the right inventory, at the right place, including home. The interesting moves and counter moves are heating up between the key technology and service providers for the retail market in response to the consumers’ demands for omni-channel demand. This is keeping these solution providers on their toes, placing huge bets in development investments and buying or merging with other technology companies. The recent merger of RedPrairie and JDA, Aldata’s merger with EYC to become Symphony EYC, and NetSuite’s purchase of Retail Anywhere are emblematic of this trend (for more on recent M&A, see Wheelers and Dealers in Supply Chain Solutions). The rising emphasis on omni-channel has reached a pitched crescendo this year, with no signs of abating. One of the reasons it is ‘taking so long’ is there are so many dimensions to really doing omni-channel well. It touches everything. Even though e-commerce has been around for well over a decade, we are really just getting started on the journey of putting in place the various dimensions of the foundation for wide spread true omni-channel integration. In reality there are currently centers of gravity—unifying the front-end (the shopper experience) vs. unifying the back-end (fulfillment). For now that is probably the enterprise’s best approach, since, especially the front-end mobile game is just discovering itself (see our Mobile Forecast). Here I’ll touch on some of my conversations with solution providers at NRF to highlight these various dimensions. Omni-channel requires that the store is integrated within itself and within the supply chain. There were several examples of this at NRF. In the “integrating with the supply chain and other stores” category, Manhattan, whose heritage is the warehouse, introduced Store Commerce Activation shortly after last year’s NRF and was showing it off this year. 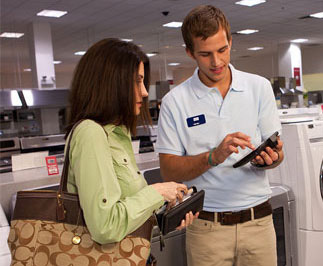 Store Commerce Activation helps improve in-store inventory accuracy via scan-based receiving, quality inspection, inventory counts, and inventory locating in the store. When the store is out of stock of an item, it lets sales associates, while with the customer on the store floor, search for available inventory elsewhere in the supply chain, including other stores … a key element of omni-channel. Once inventory is located, it can be allocated and a fulfillment request executed. At the store that has the inventory, the platform enables packing, rating and shipping parcel packages direct-to-consumer or store-to-store transfer with direct integration to the major parcel carriers. This pick, pack, ship part can be used not only for fulfilling orders from other stores, but for fulfilling orders from e-commerce or any other channel. I didn’t have time to see a demo, but according to the folks at Manhattan a lot of effort was put into making the user interface very easy to use, accommodating the typical retail labor force. For years Tyco has been building out its store integration platform TrueVue (see The Integrated Store for more on this concept). The idea is to integrate the various retail store functions—security and loss prevention, labor/workforce management, inventory, promotions, and merchandising—on a common platform with integrated processes and personnel. Tyco already integrates the various devices and systems such as EAS, video, traffic counters, RFID, and POS. As a further step, Tyco announced an alliance and integration with RetailNext’s traffic analytics, enabling Tyco’s TrueVue platform to do dwell time analysis, display analysis, heat maps, and facial detection. Consumers would like a unified experience via all the various channels through which a retailer sells and delivers. One example of a solution to meet that was NetSuite’s announcement on January 10th of their acquisition of Retail Anywhere, a cloud-based POS system. At NRF, I spoke with Branden Jenkins who was the CEO of Retail Anywhere and is now the General Manager of NetSuite’s retail business. The combined offering integrates Retail Anywhere’s cloud-based POS, with NetSuite’s eCommerce, CRM, warehouse management, and full backend ERP system. This provides the foundation for omni-channel, enabling a mid-sized retailer to have many of the same integration benefits that the larger retailers have custom integrated. Microsoft Retail's entire suite was built organically as single platform1 supporting omni-channel, front-to-back integration of various channels: their own mobile and fixed POS, ecommerce, Facebook and Twitter, and online marketplaces such as eBay. This enables a retailer, for example, to define a promotional campaign (or tax schema or pricing strategy, etc.) once and push it out in a coordinated way to all channels, providing native consistency and integration across the channels. The same consistency is inherent in the view of products and inventory across channels. Microsoft told me there is no limit to the number or types of channels that can be integrated into their Dynamics AX ERP system. I've reviewed Dynamics AX multi-layered architecture and it does make their system particularly adaptable and extendible. Microsoft's Retail solution seems to be the most complete of their various vertical solutions they currently have. Here they have gone beyond their traditional mid-market base to serve mega-retailers such as Carrefour. SAP also has had a strong year for their retail business, particularly driven by omni-channel. They improved visibility across channels, helping provide a unified view of inventory across all locations, and the ability to treat it all as one big pool of inventory, rather than separate silos for each channel. Further, they have enabled picking in the store. All supported by multi-level supply chain forecasting and replenishment—from consumer, to store, to DC to vendor/supplier and rolling it all up. Another example I saw was QThru, a mobile shopping and self-checkout platform. What I found interesting was their tie-together of store-based shopping/self-service scanning by the consumer using their own smart phone, self-checkout, and e-couponing. My admittedly unscientific and completely anecdotal experience in trying their system was that the barcode scanning capability of QThru’s solution seemed to be more reliable than other smartphone-based scanning solutions I’ve seen. That removes one barrier to adoption, since no one wants to stand there trying several times to scan an item. When done shopping, there’s no waiting in line. You can self checkout just by pointing your phone’s camera at a 2D barcode displayed on either a kiosk or on one of the store associates’ hand held devices. Payment is done using the credit card information that you previously entered—and even that step can be done by just taking a picture of your credit card which extracts and stores the card information (not the image) in a cloud-based PCI DSS compliant vault. Where it gets interesting with QThru, as you scan each item, you can add it to a favorites list or directly to a shopping list for future use. You can also manually add items to your saved shopping list wherever you are. The next time you are ready to buy, with a click you send your shopping list to the retailer. The store associate uses the QThru app to pick and bag up all of the items on the list and when done sends back the completed order with all pricing and product details. You approve and pay for it right from the app and indicate a desired time to pick up the items from the store. Everything is waiting for you—you just pick it up and go. One of QThru's grocery retail customers will be offering in-store pickup service in Q2 of this year. Mobile couponing is something that many startups have been taking a stab at. What QThru has done is to integrate the coupon into the mobile shopping and checkout process. Cross-selling and upselling offers can be made based not just on the shopper’s past purchase history, but on what the shopper has in their list or basket right now. Want some dip to go with those chips you just scanned? And then at checkout, there is a direct correlation from the offer to what was actually purchased, allowing the brand owner to see exactly which coupons are effective. This eliminates the expensive, slow, and error-prone paper-based manual backend processing of coupons. Independent of whether coupons are used, loyalty information about what a specific shopper is buying is an automatic byproduct of the QThru systems. While QThru is not a comprehensive omni-channel solution, it brings together many of the elements of a multi-channel shopping experience in a new integrated way that retailers and shoppers could really get hooked on. Successful omni-channel also requires an end-to-end view of inventory from supplier to DC to store (see Omni-Channel Inventory: Getting the Big Picture). To be able to ship from anywhere, you need to know what you have everywhere. LogFire’s cloud-based WMS provides this type of view, extending their DC functionality starting from the PO/supplier all the way to the store (see Extending the Reach of the DC). On January 10th, LogFire announced their partnership with Blue Ridge to provide an integrated cloud-based supply chain planning and execution capability. This further broadens the footprint of an all-cloud supply chain platform. Also at NRF, I met Richard Anson, the Founder of Reevoo. This was one of the more interesting companies I met (though I am not going to try and tie them into the omni-channel theme). They offer a platform and service to collect reviews from customers who have bought products from a brand owner or manufacturer. You might think “Big deal, Amazon and others already do that.” There are several aspects that I think are revolutionary. First, they provide a way for the brand owner to own and access the customer review process, while keeping it entirely unedited, complete (not cherry-picking) reviews, and managed by a third party. Reevoo will moderate and publish all reviews that are entered, except those containing things like profanity, proprietary information, or libelous comments—and even those are sent back to the reviewer to allow them to modify their comments to be publishable. Consumers highly value these types of unfiltered reviews, especially when they know they are reading the good, the bad, and the ugly reviews. 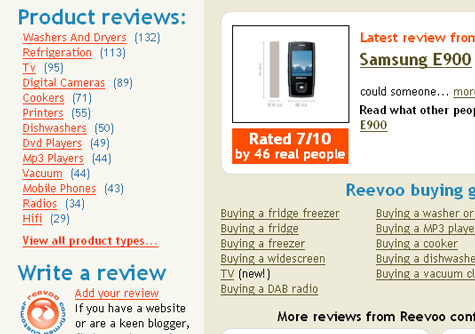 Further, Reevoo achieves an impressive 15% average review rate for retail products (higher for travel sites). What really impressed me (as a former product manager) was how they can take that review stream, parse and feed it into the various departments within the brand manufacturer, such as marketing, product development, and service and support. This is an invaluable stream of data, helping to find out what people love and hate about the products and services you are delivering. Furthermore, a marketing person can scan the reviews and follow up to get more information from particular reviewers or build a virtual focus group on the fly. It is topped off with dashboards for the CMO, customer service, product development, and merchandising executives to view overall performance and trends. I think the concept is brilliant, and I look forward to seeing how well Reevoo does in continuing to deliver this to the market. There were many other great things I saw at NRF, which time and space don’t allow. I was happy to see the optimism (even if tempered) and the progress that we are making towards this huge undertaking of getting to true integrated omni-channel retail experiences.